Preheat oven to 350°. Coat an 8x8-inch baking pan with cooking spray. In a large bowl, use a hand mixer to combine butter, sugar, vanilla, baking cocoa, salt, food coloring and vinegar. Add eggs and mix well to combine. Add flour, ¼ cup at a time, blending well between each addition. Reserve ¼ cup of batter. Pour the remaining batter into prepared baking pan. In a medium bowl, use a hand mixer to combine the cream cheese topping ingredients. Blend until smooth. Spread the cream cheese topping evenly covering the brownie batter. 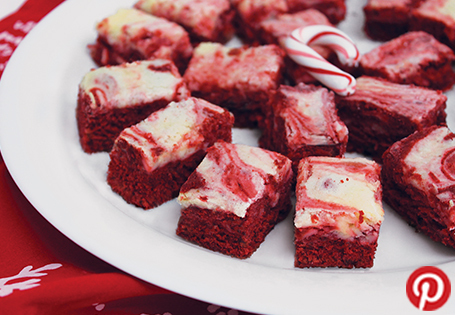 Drop teaspoons of the reserved brownie batter on top of the cream cheese layer. Using a knife, drag zigzag lines through the batter to create a swirl design. Bake for 30 minutes. Cool completely before slicing. Keep refrigerated.